These Terms explain how you may use this website, e2x.com and all associate pages (the Site) which is provided by us free of charge. By accessing this Site you agree to adhere to our Acceptable use policy appended to these Terms. The Site is intended for use only by those who can access it from within the UK and United States. If you choose to access the Site from locations outside the UK, you are responsible for compliance with local laws where they are applicable. This Site and all intellectual property rights in it including but not limited to any Content are owned by us. Intellectual property rights mean rights such as: copyright, trademarks, domain names, design rights, database rights, patents and all other intellectual property rights of any kind whether or not they are registered or unregistered (anywhere in the world). We and our licensors reserve all of our and their rights in any intellectual property in connection with these Terms. This means, for example, that we and they remain owners of them and free to use them as we and they see fit. While we try to make sure that the Site is secure, we cannot guarantee the security of any information that you supply to us and therefore we cannot guarantee that it will be kept confidential. For that reason, you should not let us have any patentable ideas or patent applications, advertising or marketing suggestions, prototypes, or any other information that you regard as confidential, commercially sensitive or valuable (Unwanted Submissions). While we value your feedback, you agree not to submit any Unwanted Submissions. The Site may contain hyperlinks or references to third-party websites other than the Site. Any such hyperlinks or references are provided for your convenience only. We have no control over third party websites and accept no legal responsibility for any content, material or information contained in them. The display of any hyperlink and reference to any third-party website does not mean that we endorse that third party's website, products or services. Your use of a third-party site may be governed by the terms and conditions of that third-party site. No changes to these Terms are valid or have any effect unless agreed by us in writing. We reserve the right to vary these Terms from time to time. 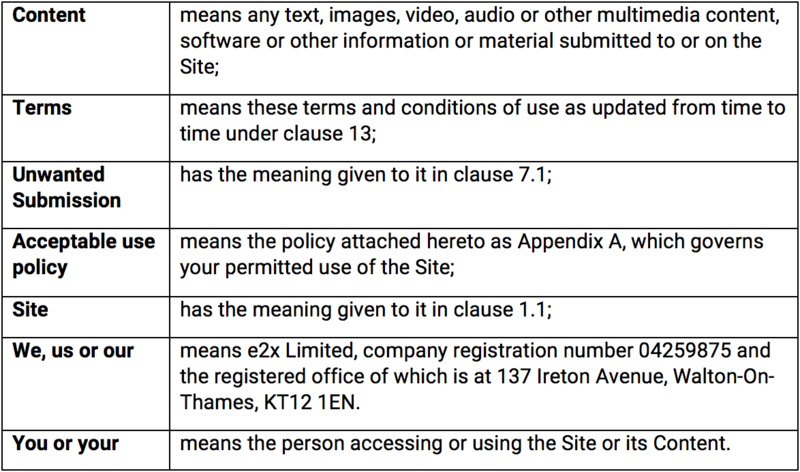 Our updated terms will be displayed on the Site and by continuing to use and access the Site following such changes, you agree to be bound by any variation made by us. It is your responsibility to check these Terms from time to time to verify such variations. We permit you to use the Site only for personal, purposes and primarily for accessing information about us. Use of the Site in any other way, including in contravention of any restriction on use set out in this Policy, is not permitted. If you do not agree with the terms of this Policy, you may not use the Site. to comply with the provisions relating to our intellectual property rights and software contained in our General website terms and conditions of use. You may not use our trade marks, logos or trade names except in accordance with this Policy and our general website terms and conditions of use. Where we give permission to use our trade marks, logos or trade names, you shall do so only in accordance with our brand guidelines. E2X Limited (“E2X”, “we”, “our”) are one of the thought leaders in eCommerce and retail that celebrates ‘headless commerce’. For more information see https://www.e2x.com/who-we-are. E2X collects, uses and is responsible for certain personal information about you. When we do so we are regulated under the General Data Protection Regulation which applies across the European Union (including in the United Kingdom) and we are responsible as ‘controller’ of that personal information for the purposes of those laws. We collect personal information about you when you access our website and/or contact us. We collect this personal information from you either directly, such as when you contact us or indirectly, such as your browsing activity while on our website (see ‘Cookies’ below). provide you with any feedback you request. Our website is not intended for use by children and we do not knowingly collect or use personal information relating to children. We will not share your data with any third-party companies to fulfil the purposes listed above. Some of our systems are cloud based and may be based outside the European Economic Area — for further information including on how we safeguard your personal data when this occurs, see ‘Transfer of your information out of the EEA’. We rely on the legitimate interest ground as the lawful basis on which we collect and use your personal data. Our legitimate interest is to provide you with information relating to E2X products and the ecommerce industry. E2X have weighed this against your fundamental rights as an individual and are content that this is a proportionate use of your personal data. You have the right to unsubscribe from any contact by selecting and unsubscribe option which is included in all communications. We may contact you in accordance with your preferences, by either phone or email, with any news and marketing regarding all services or products offered by E2X. Such countries do not have the same data protection laws as the United Kingdom and EEA. Whilst the European Commission has not given a formal decision that the USA provide an adequate level of data protection similar to those which apply in the United Kingdom and EEA, any transfer of your personal information will be subject to appropriate safeguards (as permitted under Article 46(5), of the General Data Protection Regulation that are designed to help safeguard your privacy rights and give you remedies in the unlikely event of a misuse of your personal information. If you would like further information, please contact our Security Team as detailed in the ‘Contact Us’ section. We will not otherwise transfer your personal data outside of the EEA or to any organisation (or subordinate bodies) governed by public international law or which is set up under any agreement between two or more countries. If you would like to unsubscribe from any email newsletter you can also click on the ‘unsubscribe’ button at the bottom of the email newsletter. It may take up to 14 days for this to take place. We hope that our Security Team can resolve any query or concern you raise about our use of your information. If however, this has not been the case, the General Data Protection Regulation also gives you right to lodge a complaint with a supervisory authority, in particular in the European Union (or European Economic Area) state where you work, normally live or where any alleged infringement of data protection laws occurred. The supervisory authority in the UK is the Information Commissioner who may be contacted at https://ico.org.uk/make-a-complaint/ or telephone: 0303 123 1113. For example, we may monitor how many times you visit the website, your language preferences, which pages you go to, traffic data, location data and the originating domain name of your internet service provider. This information helps us to build a profile of our users. Some of this data will be aggregated or statistical, which means that we will not be able to identify you individually. We will ask for your permission (consent) to place cookies or other similar technologies on your device, except where these are essential for us to provide you with a service that you have requested (e.g. to enable you to put items in your shopping basket and use our check-out process). This policy was published on 27 March 2019.